It's been dubbed 'The Great Wall Of Calais'. A “a big, new wall” is to be built in Calais in an effort to halt the flow of refugees and migrants crossing the Channel to the UK aboard lorries. Construction of the four-metre high, one-kilometre long concrete structure will begin this month, immigration minister Robert Goodwill told MPs on Tuesday, with the project costing £1.9m. The wall has already been dubbed the “Great Wall of Calais”. Goodwill said: “People are still getting through. We have done the fences. Now we are doing the wall. Just over 84,000 migrants were stopped last year by UK Border Force guards on French soil according to figures released last month. The wall will stretch either side of the ferry port’s main dual-carriageway approach road where those seeking to reach Britain attempt to climb aboard lorries passing through. It will be made of smooth concrete in an effort to prevent people scaling it and will replace the current fence. The plan has already attracted criticism. French aid worker, François Guennoc told the Guardian: “This wall is the latest extension to kilometres of fencing and security surveillance already in place. It will just result in people going further to get round it. “When you put walls up anywhere in the world, people find ways to go round them. The Road Haulage Association, who represents the drivers whose lorries are targeted by migrants, is skeptical of the plan, arguing a better alternative would be to step up security on the approach roads to Calais. The main road to the port was brought to a grinding halt on Monday by at least 60 trucks and 100 tractors, as hundreds of vehicles staged a huge ‘go-slow’ protest meaning any traffic coming from the UK found it “almost impossible” to leave Calais. 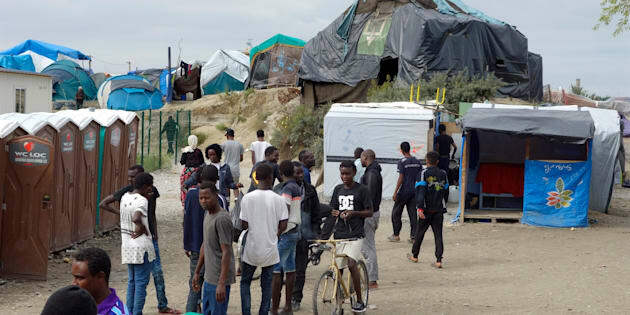 The demonstration, named ‘Operation Escagot’ or Operation Snail, has been called the “nuclear red button” for drivers protesting about the Calais migrant camp known as The Jungle. The planned wall is part of a joint £17m deal between France and the UK. The Tories have long struggled to reach their target of reducing immigration to the tens of thousands with Goodwill calling it a “big challenge”. He said: “That is our clear objective and we intend to pursue every visa route that we can to reduce those numbers.